Published May 17, 2018 By Julia 15 CommentsThis post may contain affiliate links. Flourless keto brownies with walnuts, only 1.5g net carbs each and easy to make. Great for low carb, paleo, sugar free, and gluten free diets. These keto brownies are sinfully good. They’re moist and have a strong chocolate flavor, with a texture somewhere between fudgy and chewy. If you’re like me and want that extra crunch in your brownies, toss some chopped walnuts into the batter before baking. For a sweet-and-salty combo, I also like to sprinkle some sea salt on top of the brownies. 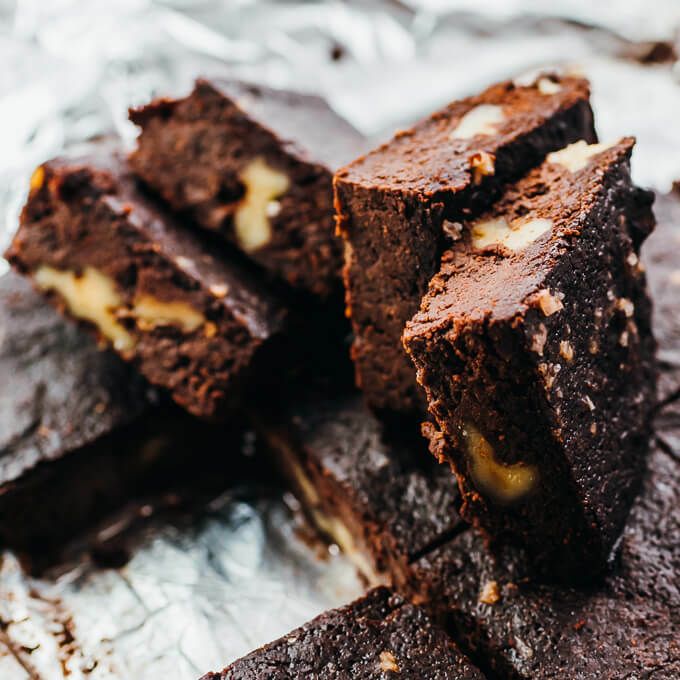 This recipe is the sixth iteration of these low carb brownies, as it took that many experiments before I finally got it right. 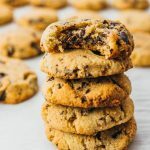 For me, low carb baking (like brownies and keto chocolate chip cookies) is always going to be harder than cooking savory stovetop or Instant Pot dishes. There was literally a month or two when I was eating brownies almost every day — not that I can really complain. Keto brownies are straightforward to make. No electric mixer or any special equipment needed; just a mixing bowl and a wooden utensil for stirring. 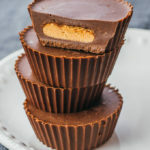 The ingredients go in one at a time: first the cocoa powder and boiling water to melt it, then vegetable oil and eggs, and lastly the sugar free sweetener and almond flour. It’s ideal to use a kitchen scale to measure out the ingredients instead of using volume estimates. The batter is poured over a greased foil-lined 8×8 inch glass baking dish. Whether you use a glass, light metal, or dark metal pan will make a difference in the baking time of your brownies. That’s why the back of cake mix packages will often provide different cook times for different pans. The recipe below has cooking time estimates optimized for glass. If you use metal, you might have to tweak the baking time depending on your oven. It’s important to not overbake brownies. Better to err on the side of underbaking. When you stick a toothpick in the center, it should come out with a few moist crumbs but not drenched. 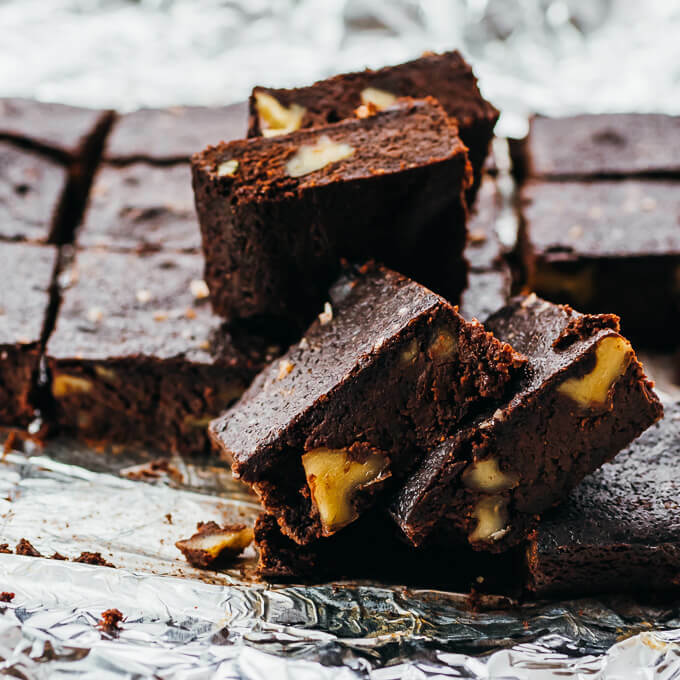 Glass pans have high heat retention, so once the brownies are out of the oven, you’ll want to lift the foil to move the brownies from the pan onto a cooling rack. Otherwise, brownies sitting in a hot glass pan will continue cooking and can lead to overbaked brownies. 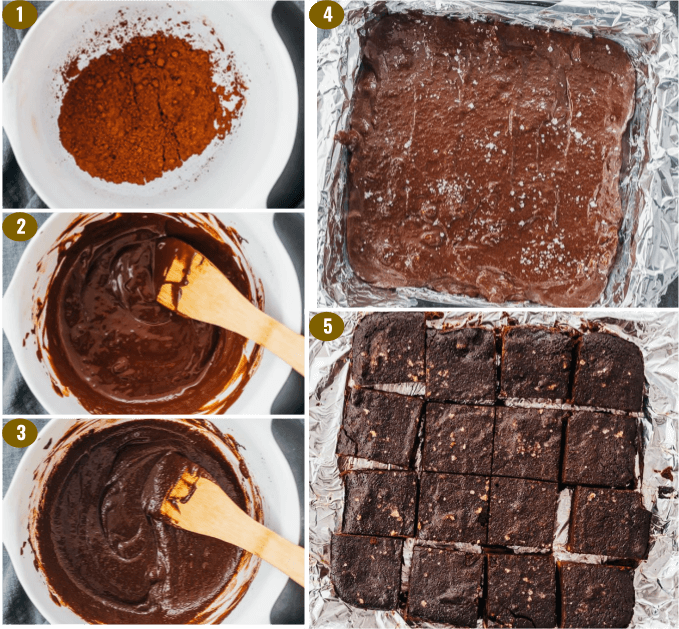 For optimally chewy brownies, let the brownies completely cool before cutting into them. This can take up to two hours, but your patience will be highly rewarded! There are two different kinds of unsweetened cocoa powder: natural and dutch process. Dutch processed cocoa has been treated with an alkalizing agent to lower its acidity and it allows more of the chocolate flavor to shine through. Depending on the recipe, you can’t substitute one with the other due to leavening. For these keto brownies, you should use dutch processed cocoa since there aren’t any leaveners like baking soda in the recipe. If you were to use acidic natural cocoa, you would need baking soda to neutralize it. To tell which type of cocoa you have, check the packaging. If the ingredient list says “alkali” anywhere, that means it’s dutched; otherwise, it’s natural. The dutch processed cocoa powder also has a noticeably darker color than natural cocoa powder, which affects the color of the resulting brownies. You can read more about the differences between these two types of cocoa and how to know which one to use in a recipe. What kind of vegetable oil can I use? I recommend any vegetable oil with a neutral flavor and less than 10% saturated fat by weight for ideal texture. This means you can’t use butter (52% saturated fat) or coconut oil (82%). I recommend canola oil (7%). For those of you unsure if canola oil is healthy or not, you can rest assured that canola oil is a safe and healthy fat — check out this explanation by a Harvard nutrition professor and this answer from a Mayo Clinic dietitian. What kind of sweetener can I use? I recommend swerve because it’s a 1:1 replacement for sugar. You can use either granular or confectioners, as their granular form is already very fine. It’s important to measure it out by weight and not volume. Another option is to use pure erythritol, which I haven’t tested with this recipe. Since erythritol is only about 70% as sweet as Swerve, you’ll need to increase the amount to 8.5 ounces. This will throw off the ratio of wet to dry ingredients. It’ll also result in a thicker batter. Make sure it’s powdered because erythritol granules aren’t fine enough. Can I replace walnuts with pecans? No. In my tests with pecans, they gave a burnt taste to the brownies. Walnuts bake much better. I haven’t experimented with other kinds of nuts, but chopped macadamia nuts would likely be great. 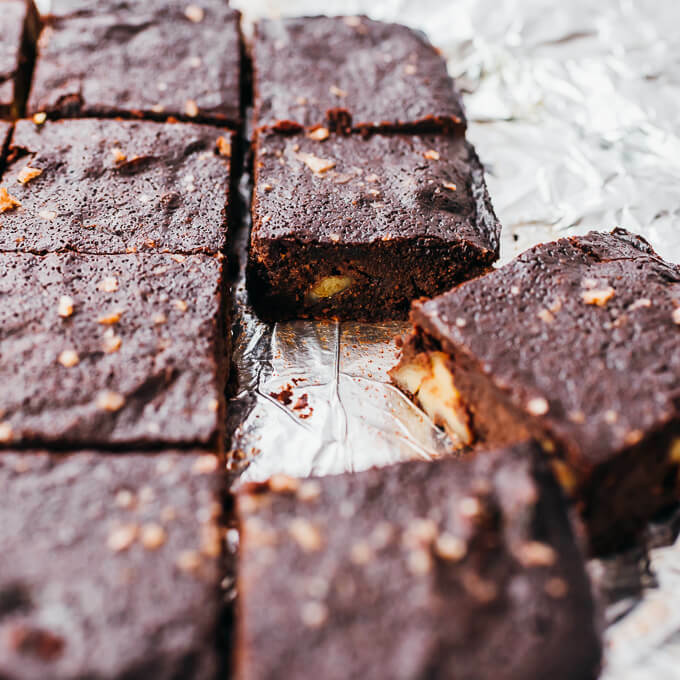 Once your brownies have completely cooled after baking, cut them into 16 squares. If you want super clean cutting lines, refrigerate or freeze the brownies to let them harden a bit. I usually pop mine into the freezer for 10 minutes before cutting. I recommend serving at room temperature. But if you prefer refrigerating them for colder brownies, that’s fine too. Either way, they’ll taste great! For storing, place the brownies in a tight covered container at room temperature for up to three days. You can keep the individual brownies from sticking to each other by separating them with wax or parchment paper. Position a rack in the middle of the oven and preheat to 350 F. Prepare an 8x8 inch baking dish and line the bottom and sides with foil. Grease the foil and set aside. In a large mixing bowl, add cocoa powder, salt, and boiling water, stirring together until smooth. Add vegetable oil and eggs, carefully stirring or whisking until completely smooth, pausing halfway to scrape down the bowl and mixing spoon. It should look like pudding at this point. Add sweetener and almond flour, and stir until well-mixed. Stir in chopped walnuts. Pour the batter into the prepared baking dish, spreading it to the edges and corners. Smooth the surface. Optionally, sprinkle sea salt on top. Bake at 350 F for about 35 minutes. It’s done when a toothpick inserted in the center has a few moist crumbs attached. Since ovens vary, start checking at 30 minutes. Let the brownies cool for 10 minutes, then pull up the sides of the foil to lift the brownies from the baking dish to a wire rack to avoid overcooking in the dish. For best texture, let it cool completely for 2 hours before cutting into 16 squares and serving. This recipe yields 1.5 g net carbs per serving (1 brownie or 1/16th of the recipe). I have a sweet tooth and I love brownies! 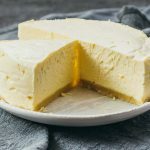 I had found some good ones that were Paleo but not low carb and finally I find these! They are delicious! And if anything they are even better the second day. I often like just a little bit of something sweet and this does the trick. I will be making these often I am sure! Love them! Can the granular swerve sweetener be substituted by liquid stevia? I haven’t tried subbing with liquid stevia. Generally, I don’t recommend it because it significantly alters the ratio of dry to wet ingredients in the recipe. Can the vegetable oil be substituted with another kind of oil? See above post under the section called “Common Ingredient Questions” where I talk about other oils you can use. Basically, you want something with neutral flavor and less than 10% saturated fat by weight. 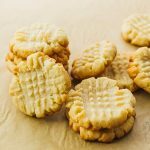 Can you substitute Coconut flour for almond flour ? I’m highly allergic to any kind of almonds . I haven’t tested this with coconut flour, so I can’t say how it’ll turn out. Coconut flour is a lot more absorbent, so it wouldn’t be a 1:1 substitution. Hi what can be substantiated for the swerve sweetener? For sweetener substitutions, see the post above where I talk about the sweeteners to use. Any kind of dry sweetener that measures the same as sugar will work, and you can use the amount listed in the recipe (6 ounces). Thank you for sharing this recipe. I made it last night. My kids won’t stop eating it and I shared it with my “keto friends” in the hospital today and they were all satisfied and ask me to bake some more. You’re very welcome!! That’s awesome that your kids and keto friends loved it. Hope you get the chance to make some more soon! 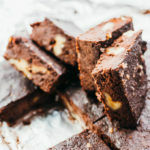 I have made this recipe at least 3X and it is even better than my old non-keto brownie recipe. I do use chopped pecans though and it is wonderful!